Contrary to their name (‘milli’ meaning ‘one thousand’ and ‘pede’ meaning ‘foot’), millipedes do not actually have a thousand legs. Their legs usually number in the hundreds, but the final count depends on the particular species. They have two pairs of legs coming from each body segment. This makes them easy to tell apart from centipedes (which have only one pair of legs per body segment). Australia has around 2000 species of millipedes, with most being nocturnal and feeding within the leaf litter and mosses of our moist forests. One species however has given millipedes a bad name in Australia, and in typical fashion the culprit is an introduced species. The Portuguese Millipede was introduced to Australia in the 1950’s and has colonised southern Australia rapidly since then. They are easily recognised as they are the only shiny black millipede in our local area and have a habit of curling into a flat spiral. With environmental conditions in the southern half of our country suiting Portuguese Millipedes, and having no natural predators, they often breed into plague numbers. In 2002, there were so many Portuguese Millipedes on the train lines between Melbourne and Ballarat that 50 trains were prevented from running. Few people would believe that such small animals could stop a train, but the mush and oils from millions of dead millipedes on the tracks caused the trains to lose traction, and the mess had to be cleaned off before services could resume! liquid. Many people will be familiar with the pungent smell of the Portuguese Millipede, and it is for this reason that most predators will steer clear. The eggs of millipedes are laid underground in moist areas. From these hatch babies which are usually pale in colour and have less body segments (and legs) than their parents. They grow by shedding their outer skeleton, and emerge with extra segments and legs each time until they have the full complement. Australia’s longest millipedes live in the rainforests of north Queensland and can reach lengths of up to 20cm. Not all are so long as these, though – some species called pill millipedes look a little like slaters, and make use of the ability of some of these look-alikes to roll up in a ball. 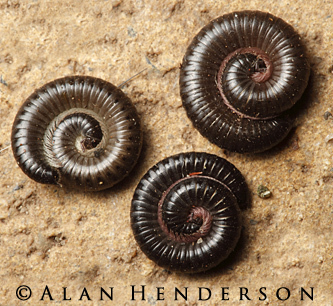 They are easy to tell apart as pill millipedes have over twenty pairs of legs – a vast contrast to the seven pairs of slaters.